In today’s page of Talmud we read that the disease known as karsom (כרסם) was caused by the “foam” that floats above wine, beer or water. Karsom is translated by the Soncino, Koren and ArtScroll Talmuds as catarrh, that green phlegmy discharge from our noses and mouths when we come down with a heavy cold. In his dictionary, the great philologist of rabbinic literature Marcus Jastrow notes that there is another spelling of the word, barsom, (ברסם) “a dripping like balsam, whence catarrh of the head.” And Rashi describes it as “nasal mucus” (רירין הבאין מן החוטם). In any event, the cure for one type of this mucus was beer, which raises the question - can ingesting alcohol cure disease? We are not going to examine the ongoing debate as to whether a regular glass of wine is good for you or not. At best the evidence is mixed, with any positive effects being highly dependent on not drinking “too much.” Alcohol may be cardioprotective, but only at a moderate dose and frequency of ingestion. On the other hand, even at a low dose, alcohol does some pretty terrible things to your immune system and ability to repair damaged tissue. — Jung et al. Alcohol Exposure and Mechanisms of Tissue Injury and Repair. Alcohol Clin Exp Res. 2011 ; 35(3): 392–399. — O'Keefe et al. Alcohol and Cardiovascular Health: The Dose Makes the Poison...or the Remedy. Mayo Clin Proc.2014;89(3):382-393. In the 1850s, London (and much of Europe) suffered a series of cholera outbreaks, and no-one knew what caused them. But John Snow (1813-1858), anesthesiologist to Queen Victoria had a hunch. 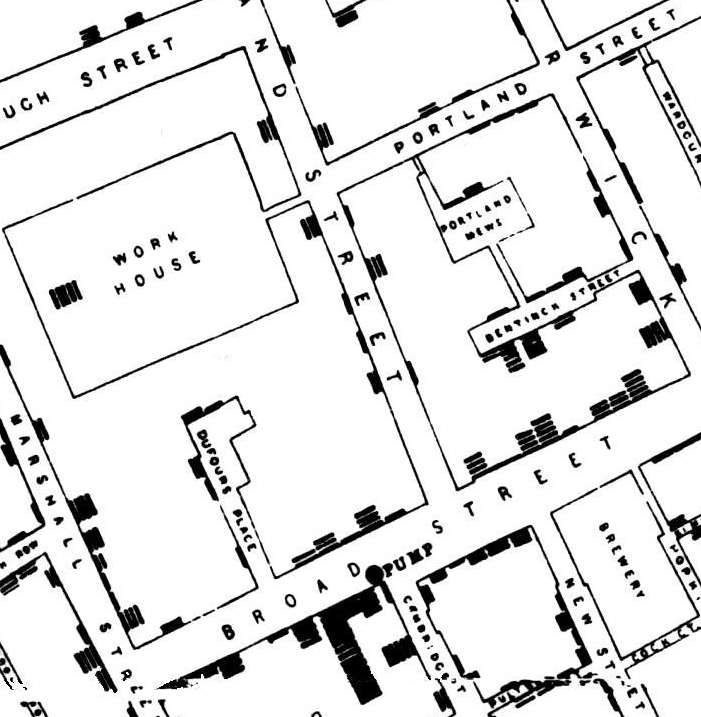 He drew a map of the deaths around the Broad Street pump, which, he suspected was somehow involved in transmitting whatever it was that was spreading the disease. John Snow. On the Mode of Communication of Cholera. London, John Churchill 1855. p42. The men had been saved by their allotted drinks of beer, which came from a separate well and not from the one on Broad Street. This explanation did much to bolster Snow’s suspicions. On September 8, 1854 he famously removed the pump handle which prevented the pump from being used and, so the story goes, the cholera epidemic was averted. The Talmud had suggested wine would fight some infections. In the last century physicians had a similar idea. In 1913 in New York, a physician named John Hopkirk published a small book: Influenza. Its History, Nature, Cause and Treatment. To cure some of the many complications of influenza (including pneumonia and otitis media) Hopkirk wrote that “it will always be necessary…to administer port or champagne…there is no finer pick-me-up after an attack of influenza than good “fiz”.” During the Great Flu Epidemic of 1918 a few years later, physicians reverted to a similar strategy. Writing in the London Times on November 1, 1918, Britain’s chief medical officer had limited advice: wear small face masks, eat well, and drink a half bottle of light wine. When celebrating the festival of Purim, the Talmudic sage Rava recommends (Megillah 7b) that a person drink until they are so inebriated that they cannot distinguish between the phrases “cursed is Haman” (the enemy of the Jews), and “blessed be Mordechai” (one of the key figures in their salvation). Perhaps in doing so, we can remain sober enough to remember that from the time of the Talmud until today alcohol was thought to prevent and cure all manner of disease. But only in moderation.